After consulting India and Pakistan, the World Bank has appointed a Swiss expert to “address differences” between them concerning the Baglihar hydropower project in Jammu and Kashmir. The third round of Kishenganga project talks collapsed on Tuesday with the Indian side refusing to accept the issue as a ‘dispute’ between the two sides and Pakistan insisting on the word. At least 54 persons were killed in a string of blasts in Iraq today as US troops battled insurgents in the lawless western hinterland during a massive operation against Abu Musab al-Zarqawi’s network. Four persons were killed and several injured today in a violent protest in Afghanistan sparked by reports US soldiers were desecrating the Koran at Guantanamo Bay, a doctor said. The international Cassini spacecraft has spied a tiny new moon hidden in a gap in Saturn’s outer ring, scientists said. The moon was spotted earlier this month in the centre of the Keeler gap, making waves in the gap edges as it orbits. The decision to appoint Prof Raymond Lafitte, a civil engineer and professor at the Swiss Federal Institute of Technology in Lausanne, has been made after “consultation with Governments of India and Pakistan”. Lafitte has been found “suitably qualified” for the job and under the terms of the Indus Water Treaty, his determination will be final and binding, the bank said in a statement. “Prof Lafitte... will be asked to make a finding on differences between the two governments concerning the construction of the Baglihar project,” it said, adding that his findings would be made known in time. The bank is a signatory to the 1960 Indus Water Treaty between the two countries. It was approached by Pakistan for arbitration as it felt that India was constructing the hydropower project over the Chenab in violation of the treaty. The two countries failed to resolve their differences in their talks held earlier this year. The third round of Kishenganga project talks collapsed on Tuesday with the Indian side refusing to accept the issue as a ‘dispute’ between the two sides and Pakistan insisting on the word. According to insiders, differences also cropped up on the modalities of the ruling clause of the Indus Basin Treaty under which a solution to the problem has to be found. 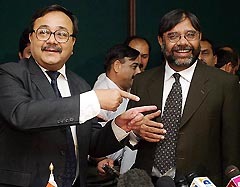 The Indian side insisted that clause 8 should rule the talks and required both sides to demonstrate a ‘cooperative spirit’, exchange data and sit together to solve problems. The Pakistani side asserted that the dam issue had already assumed the proportion of a dispute during the past 10 years. Pakistan raised its objections in mid-nineties when India had expressed its intention to start the project. Besides, two formal meetings were held in the last six months. India had already provided partial data about the project and Pakistan formalised all its objections. The dam issue, Pakistan believes, has become a ‘dispute’ and should be ruled by clause 9 of the Indus Basin Treaty that legally binds both sides to solve ‘disputes’ and provides a further mechanism in case of failure. The Indian side repeatedly said that the invoking of clause 9 was premature and refused to accept Pakistan’s stance, triggering collapse of the talks, the sources said. Briefing newsmen after the talks, Indus Basin Waters commissioners from both sides said the talks had ended without achieving any ‘convergence of views’. Commissioners Jamaat Ali Shah and D.K. Mehta said though both had agreed to disagree on all six points, they had decided to hold another meeting at the end of this month in New Delhi. The two avoided calling the meeting a complete failure, saying that the decision to continue discussing Pakistan’s objections would not justify such a tag for this round of talks. Both commissioners also said a Pakistan team would visit the Kishenganga dam site in June or July this year and an Indian team would subsequently pay a visit to inspect the Neelum-Jhelum project being built by Pakistan. Mr Shah said high hopes had preceded all such meetings and the one just concluded was no exception. There were expectations to ‘achieve convergence of view’, but it did not turn out to be the case. There were many points on which the Indian side wanted more time to get the relevant information and consult people back home before finalising them. Pakistan agreed to extend the talks and the deadline, but the Indian side had been told in no uncertain terms that it had to be done within the set time-limit (July 15). Mr Mehta denied that the India side had employed delaying tactics by not showing up with fully prepared data about Pakistan’s objections. “India did present required data but Pakistani side raised subsequent questions which needed more detailed information. That is why the Indian side sought time and was granted the same,” he said. He also denied delaying conclusion on the grounds that if Pakistan’s objections were ultimately found to be valid and India had to finally adjust the design, the sooner India got to the conclusion better it would be for it. That’s why there was no use for the Indian side to play the delaying game, he maintained. About the possibility of suspension of work as a goodwill gesture on the part of India, Mr Mehta said the Indus Basin Water Treaty did not have any provision in this regard. At least four explosions went off within about an hour, in the deadliest day since the formation of Prime Minister Ibrahim al-Jaafari’s government earlier this month. A first car bomb ripped through a busy bus station in the northern city of Tikrit, killing 31 persons and wounding 70, a police officer said. A curfew was slapped on Tikrit following the blast. A suicide bomber also struck an army recruitment centre in the town of Hawijah, southwest of the northern oil city of Kirkuk, killing 20 persons. Two people were “martyred” at the scene of the demonstration in eastern Jalalabad city and their bodies were taken to the city’s Public Health Hospital, hospital’s Chief Director Fazel Mohammad Ibrahimi told AFP. Another person died at the Medical University Hospital and a fourth dead demonstrator was taken to another hospital in the city, he added. The international Cassini spacecraft has spied a tiny new moon hidden in a gap in Saturn’s outer ring, scientists said. The moon was spotted earlier this month in the centre of the Keeler gap, making waves in the gap edges as it orbits. Tentatively called S/2005 S1, the moon measures 6.44 km across and is about 136,788 km from the centre of Saturn. More observations are needed to determine the shape of the moon’s orbit but preliminary findings show it is in the middle of the gap, Joseph Spitale, a planetary scientist at the Space Science Institute in Boulder, Colorado, said.